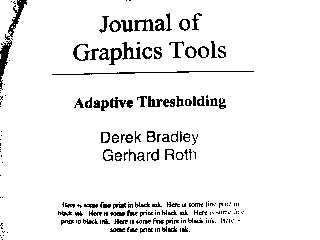 Adaptive thresholding using the internal image. 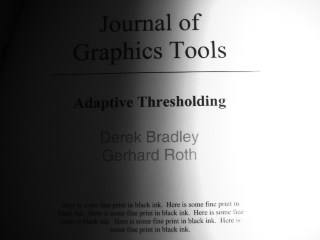 The image processing routine implements local thresholding technique described by Derek Bradley and Gerhard Roth in the "Adaptive Thresholding Using the Integral Image" paper. The brief idea of the algorithm is that every image's pixel is set to black if its brightness is t percent lower (see PixelBrightnessDifferenceLimit) than the average brightness of surrounding pixels in the window of the specified size (see WindowSize), othwerwise it is set to white.